Uptime Institute serves all stakeholders responsible for IT service availability through industry leading standards, education, peer-to-peer networking, consulting, and award programs delivered to enterprise organizations and third-party operators, manufacturers, and providers. 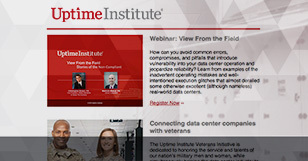 Uptime Institute is recognized globally for the creation and administration of the Tier Standards & Certifications for Data Center Design, Construction, and Operational Sustainability along with its Management & Operations reviews, FORCSS® methodology, accredited training programs and the Efficient IT Stamp of Approval. Uptime Institute experts, leadership, and support team combine to bring you proven industry experience and professional management for each step of your project with quality deliverables, clear communication, and unbiased advice. Aggregated posts to make sure our audience has access to the full breadth of what's happening within Uptime Institute worldwide including relevant client and industry news. The 451 Group, through its two operating divisions, 451 Research and Uptime Institute, provides thought leadership, syndicated research and professional services that address the dynamic nature of an expanding data center ecosystem—from facilities to the hardware and software stacks to 'IT as a service'—and its profound implications for the way enterprises plan, build, and manage their IT environments. In addition, through 451 Events, The 451 Group runs premier technology summits and conferences around the world. The 451 Group is headquartered in New York, with offices in key locations.